You can skip the tedious threading-on-skewers step when you make this easy-to-make "kabob" recipe. As a bonus, the foil packets make cleanup a snap. Spoon rice onto centres of 4 large sheets heavy-duty foil with sides folded up slightly to make rims; pour 1/4 cup water over rice on each foil sheet. Top with remaining ingredients. Fold foil to make 4 packets. Grill 15 min. or until rice is tender. Cut slits in foil to release steam before opening packets. Add a dash of your favourite seasoning, such as garlic powder, crushed red pepper or Italian seasoning, to ingredients in each packet before grilling as directed. 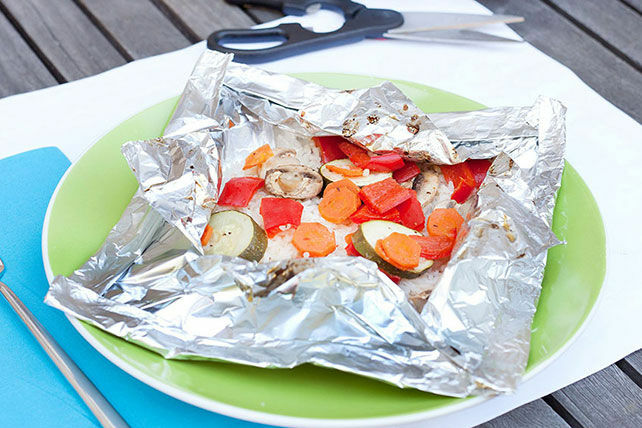 Foil packets can be refrigerated up to 6 hours before grilling as directed.